Home Business & Economy Will investors be tempted back to ‘new’ Zimbabwe? NEWLY-ELECTED President Emmerson Mnangagwa has declared Zimbabwe ‘open for business’ – but analysts say that reversing the disastrous investor exodus of the Mugabe years will require more than words of encouragement. Considered one of southern Africa’s most promising economies when Robert Mugabe took over in 1980, it was one of the most isolated economies in the world by the time his 37-year rule ended last year. Agricultural output plummeted after his regime started seizing white-owned farms in 2000, and he presided over hyperinflation so drastic it prompted the printing of a 100-trillion-dollar note. But Mnangagwa, the former Mugabe ally who replaced him with army backing in November, has made Zimbabwe’s biggest overtures towards the West in years. ‘We want to leapfrog and catch up with other developing countries,’ he said on Friday after winning an election marred by deadly violence and opposition claims of fraud. Despite the havoc Mugabe wreaked on the economy – overseeing the sharpest peacetime contraction of GDP in world history – some investors see rich potential. ‘Zimbabwe’s has had such a tarnished reputation over the past few generations that very few people have looked at it, but the interest has always been there,’ said Robert Besseling, executive director of risk consultancy EXX Africa. Some are eyeing its bounteous natural resources – the second-biggest platinum reserves in the world, as well as other minerals, coal and diamonds. Others are hunting for opportunities in the recovering agriculture sector, notably tobacco, or predicting a consumer boom in its 16 million-strong population. Hafez Ghanem, the World Bank’s vice-president for Africa, told Bloomberg last week that Zimbabwe could become ‘an upper middle-income country’ in a decade. Jack Ma, the billionaire founder of Chinese e-commerce giant Alibaba, visited last week – apparently on vacation, though it did not stop state media speculating he was scouting for opportunities. Yet even keen investors are daunted by the array of economic problems Zimbabwe faces as well as the possibility of more Mugabe-style repression, despite Mnangagwa’s insistence that the country has turned a page. Millions have fled abroad in search of work, and those who stayed still face mass unemployment. Public services are in ruins, corruption is endemic, and infrastructure crumbling. Charles Laurie of analysts Verisk Maplecroft said that until the election, Mnangagwa was progressing well in his efforts to woo investors. He reversed much of a law forcing foreign firms to cede 51 percent stakes to locals, and offered compensation to white farmers stripped of their land. But that was before troops opened fire in Harare on Wednesday on demonstrators alleging the election had been rigged, leaving six people dead. The opposition MDC party, which disputes the vote results, has since complained that its members are being targeted with abductions and criminal charges. 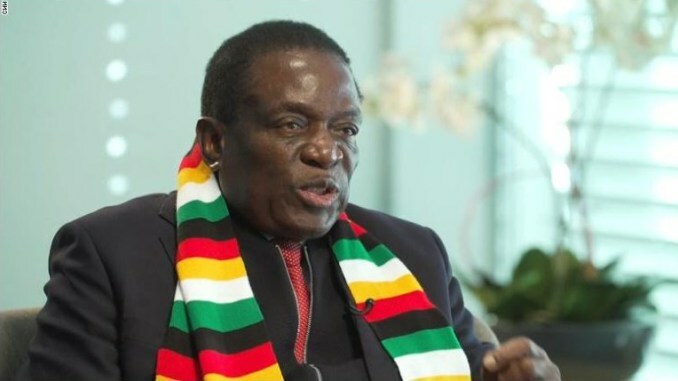 ‘For investors who are low on trust with Mnangagwa and searching for signs of his true colours, this rapid return to violent means to achieve his objectives is going to shake investor confidence,’ Laurie said. Beyond politics, Mnangagwa has major money problems. His cash-strapped government owes some $1.7 billion in arrears to the World Bank and African Development Bank, and cannot get new loans until they are paid off. Companies hoping for lucrative contracts to rebuild the transport, water and power infrastructure Mugabe left in ruins face a government that, for now, will struggle to pay them. The currency crisis is another major issue. Zimbabwe has mainly used the US dollar since scrapping its own currency in 2009 to halt hyperinflation under which prices doubled every day. But dollars remain scarce, and a little-trusted token currency known as ‘bond notes’, introduced two years ago, has done little to improve the situation. Analysts say the government will at some point have to bring in a proper currency again – and that this could prove messy, a prospect not lost on investors. To get new loans from the multilateral banks it will likely also have to agree to tough structural changes, such as tax hikes or cuts to the massive public sector. ‘For risk-wary investors, neighbouring countries offer a safer and more attractive investment environment,’ said Laurie. Besseling added that progress is likely to be slow. ‘The one-year outlook: we could potentially still be where we are today,’ he said. ‘But considering the huge potential, you’re going to see great successes in Zimbabwe over a 10-year outlook,’ he predicted. Previous articleWhat kind of beast will the African utility of the future be?